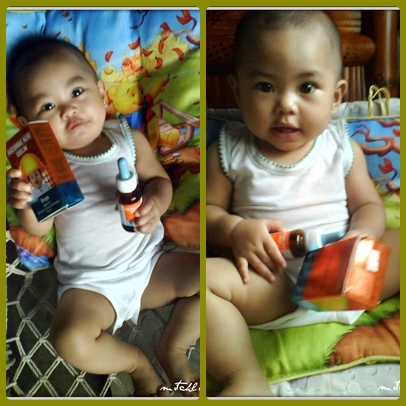 Ever since my baby turned 1 month old, Ceelin drops was already recommended to us by our pediatrician.According to the label, "increases body resistance to stress and infections and hastens recovery from illnesses..." this is true.I can see that my baby is so energetic, so active and it seems her body easily recovers from stress. I don't have a hard time making my baby take the vitamin because she likes the orange flavor of it. She's free from sickness since taking Ceelin Drops. Thanks God! For the second time, my baby's photo won. Her first was from Mommy Academy Club (I posted it here). Isn't she so cute? She's holding her ceelin bottle and the box. I'm not expecting her to win because I thought the winning photo will be based on votes. So I'm very happy when I've learned that my baby rank #4 out of 10 (you may visit ceelin's blog post here). Her daddy and I were so proud of our baby Queen. Even if her daddy always telling me not to waste time in joining contest like this and telling me "you can get nothing, you're just wasting time", I still do what I want. prizes, gifts and tokens we can get for as long as I'm proud, It's OK! Freebies, promos and contest is still a big help when you get a prize. I'm so excited to receive my baby's prize!